The Vikings have waived former third-round draft pick Scott Crichton. In 2014, coach Mike Zimmer’s first year in Minnesota, the Vikings picked the former Oregon State defensive lineman with one of their two third-rounders in the hopes he could eventually replace Brian Robison at left defensive end. But Crichton turned out to be a disappointment. Crichton appeared in 21 games in his first two NFL seasons but played sparingly on defense. 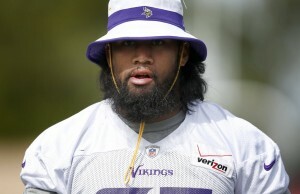 So last offseason, the Vikings asked him to switch positions to defensive tackle. Crichton, who was placed on injured reserve last August, probably would not have made the final 53-man roster. The 25-year-old made only 10 tackles with no sacks with the Vikings.